Denver, Colorado is an awesome place for a hip weekend getaway in the Western United States. With a lively and growing restaurant and arts scene that has exploded in the last few years, even people who have visited Denver before will find there are so many new things to see and do in the Mile High City. 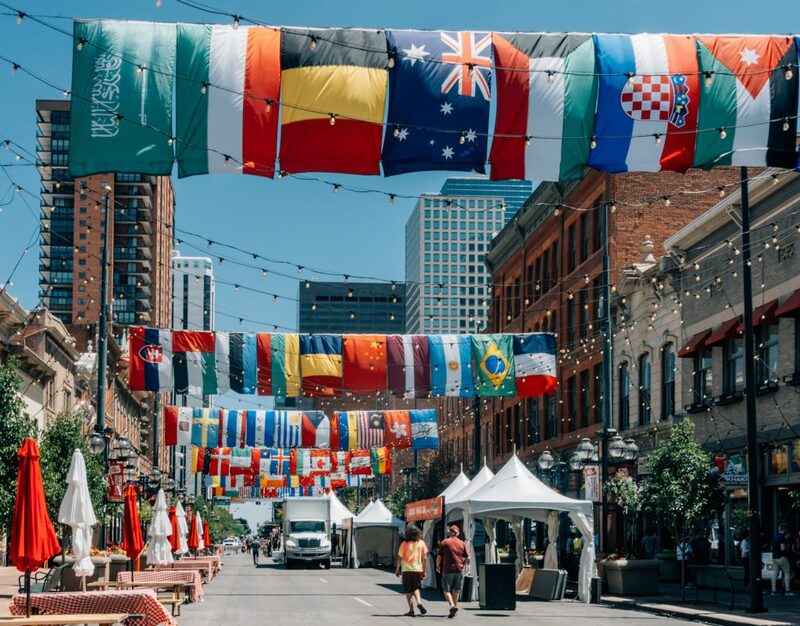 If you are visiting for just a few days are looking to design the ultimate cool and off-the-beaten-track weekend itinerary with ideas from a Denver local – this is the guide for you! I’m a native New Yorker who moved to Denver in 2016 and started the New Denizen Instagram account. This constantly updated city travel plan will help foodies, design-lovers, and budding outdoor adventurers find the most fashionable, Instagram-worthy experiences to take in during their stay. Denver is a premier vacation destination for 20- and 30-something travelers (it’s one of the cities with the fastest growing millennial population in America) across the world thanks to its amazing year-round weather (over 300 days of sunshine a year) and its ideal mix of an urban city experience that offers easy access to outdoor/adventure activities. If you are staying in Denver only for the weekend, I think you can get around fine without renting a car by walking, ridesharing, using RTD public transportation, B-cycle, Car2Go, or one of those crazy electric bikes or scooters (if you must). 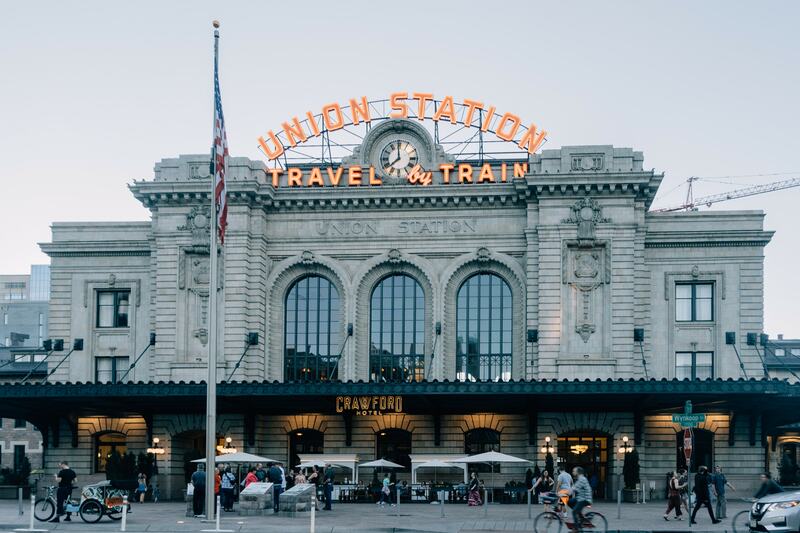 Take the A line train directly from Denver International Airport to Union Station and get straight into your exploration of the Mile High City. Historic Larimer Square is lined with restaurants and small shops. Walk down the 16th Street Mall where you will find shops, restaurants. The most charming parts are between Wynkoop and Curtis. Make a right at California, walking west until you hit 14th street where you will find the Denver Convention Center and one of Denver’s visual landmarks, the giant sculpture “I See What You Mean,” most commonly referred to as the “Big Blue Bear”. Walk down 14th, past the Denver Center of the Performing Arts, continuing until you hit Larimer Street. Now it’s time to take in some history. Larimer Street between 14th and 15th is known as Larimer Square. The most striking feature of this area is the collection of beautifully restored historic 19th-century buildings that line either side of the street, which was saved from destruction in the 1960s thanks to the work of Denver developer and conservationist Dana Crawford. Art lovers will want to check out the Dairy Block‘s alleyway space (which is free, outdoors, and open to the public) that filled with glowing neon artwork, larger-than-life installations, and pieces by world-famous art collectives like The London Police that will set your Instagram feed ablaze. There are also a few of cute stores (with more set to open in the coming year) in the complex and the Milk Market food market. 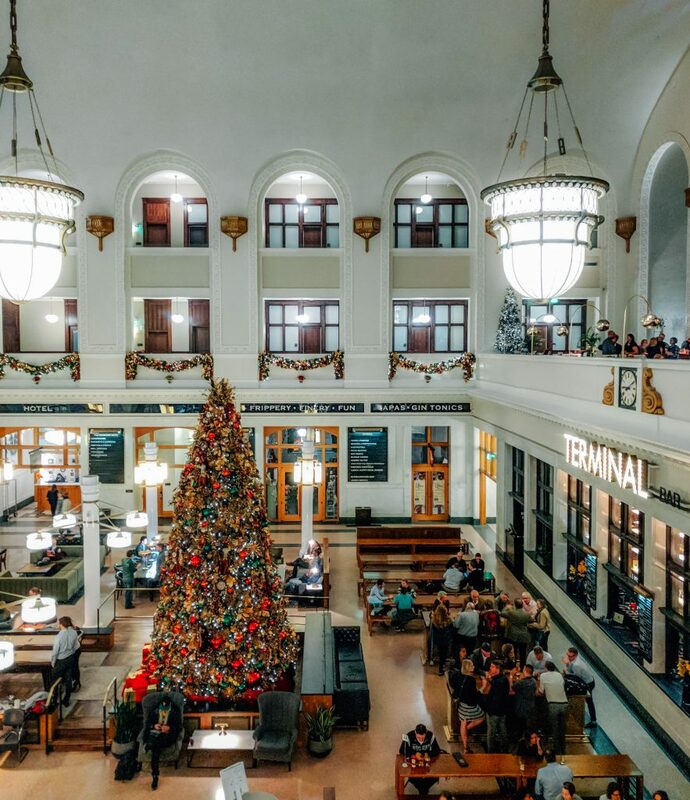 End the day by walking through the beautifully restored Great Hall at Union Station. 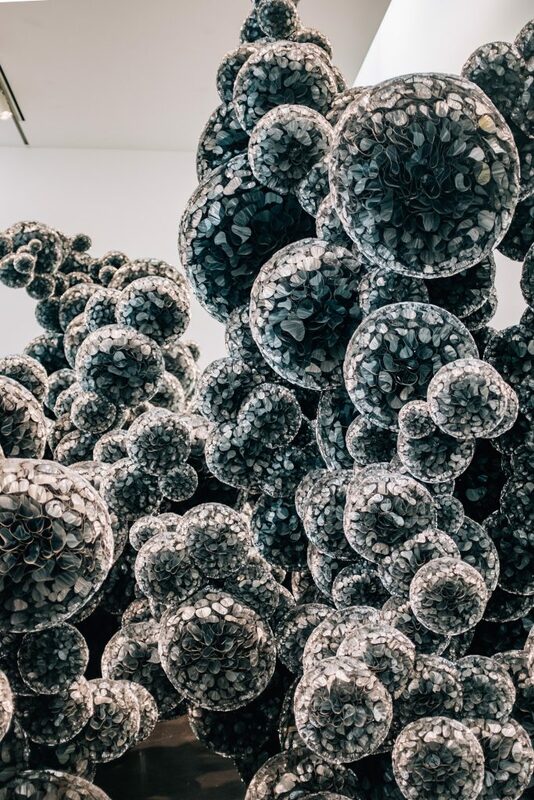 Artwork by Tara Donovan appeared at a solo show at the Denver MCA. Museum of Contemporary Art (MCA) Denver – The MCA’s bright, modern space features rotating exhibitions by regional, national, and international artists. 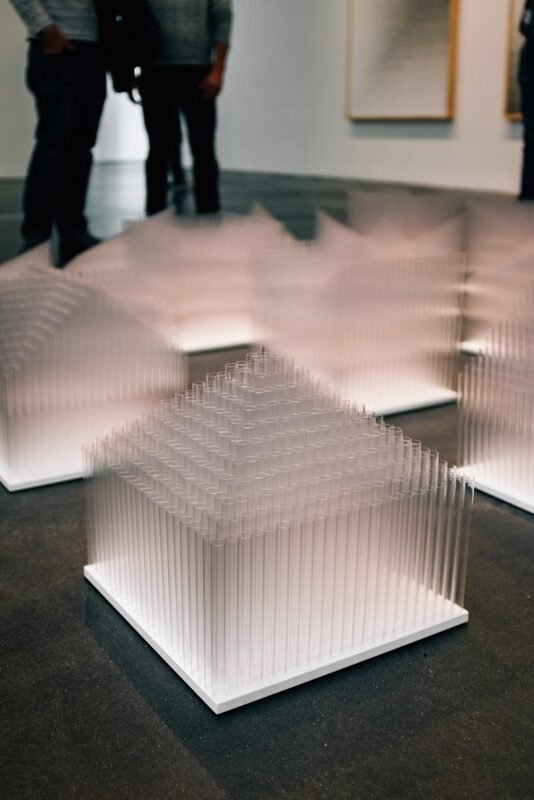 Previous exhibitions have included shows by marquee American artists like MacArthur “genius” grant recipient Tara Donovan and photographer Ryan McGinley. Be sure to check out the rooftop garden and cafe for a soothing respite from the city. Bonus: Every first Saturday of the month, Colorado residents get in for a penny! Although there are many great restaurants in Downtown Denver, I’m choosing to highlight restaurants that can only be found in Denver or are multi-restaurant operations that were founded in Colorado. Illegal Pete’s – Local chain specializing in burritos that’s a good place for a snack. A fine Chipotle (also founded in Denver) alternative. Modern Market – Another Colorado chain good for fast-casual eating. The Kitchen – Gimbel Musk (yes, Elon’s brother) runs this established New American restaurant focused on using local ingredients. Rioja – Upscale white tablecloth establishment is helmed by Jennifer Jasinski, James Beard Foundation Award winner for Best Southwest Chef in 2013 and serves a Mediterranean-inspired lunch menu Wednesday thru Friday, 11:30 am to 2:30 pm. This is a great option for sampling some of Jasinski’s refined dishes as a fraction of the cost of the full dinner menu. Tamayo – Denver-based restauranteur Richard Sandoval’s modern Mexican concept. This lively restaurant, which opened up over 16 years ago, is a Larimer Square stalwart and delivers excellent and interesting spins on Mexican classics. A must-order is the Queso Fundido with the chorizo add-on. I have dreams about that dish! Copper Lounge (on the balcony, right) has a bird’s eye view of Union Station’s Great Hall. Cooper Lounge – Perched above the Great Hall of Union Station, this is the perfect place for drinks before or after dinner. Mercantile – James Beard Award-winning chef Alex Seidel’s flagship Denver experience featuring seasonal dishes. Reservations are highly recommended, especially when dining on a weekend evening. Bonus: Read my review of the restaurant. Citizen Rail – Get here early for the superb happy hour that happens every day 2:30 – 6 pm. I like to show up around 5 to take advantage of the HH menu, then stay to order one or two entrees from the main dinner menu. 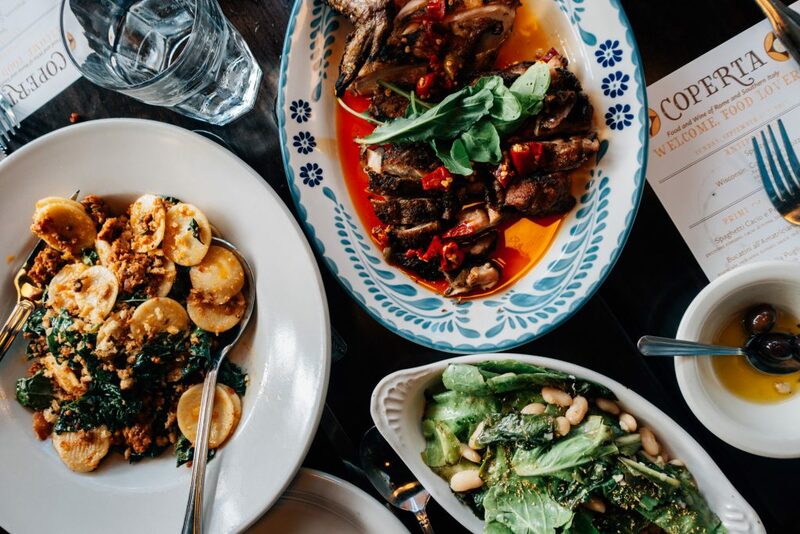 Milk Market – This food market, created by New Jersey-born Denver restaurateur Frank Bonanno, makes for a great place to grab a quick bite any time of the day. Poka Lola Social Club – Classy bar inside the Dairy Block/Maven Hotel. 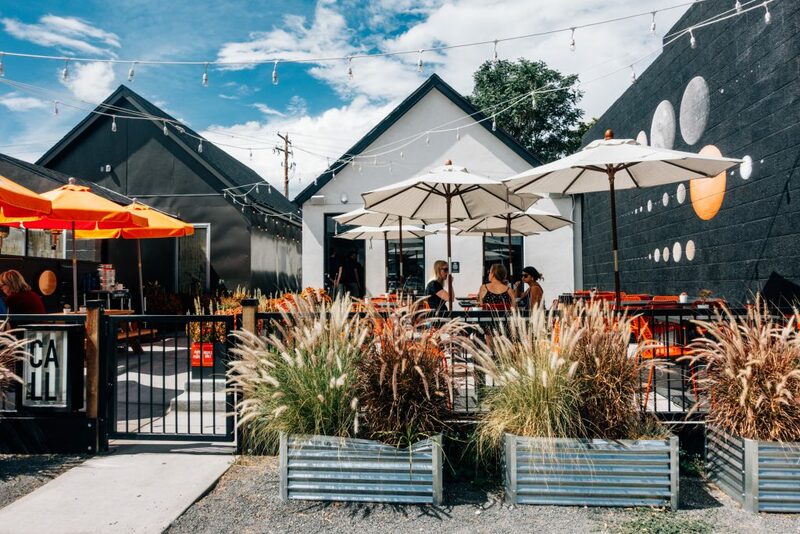 Devote your second day in the Mile High City to tapping into the creativity of the city by strolling through the museum district and walking through Denver’s hippest neighborhood: RiNo (River North). Enjoy the serenity of the Clyfford Still Museum. Start the day by heading to the heart of Denver’s museum district, which happens to be right near the State Capitol. 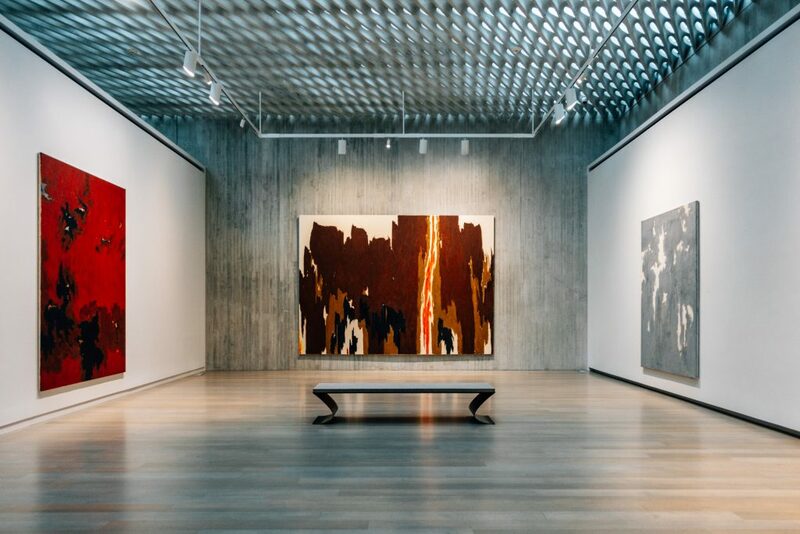 Clyfford Still Museum – Devoted to the works of abstract expressionist painter Clyfford Still, this beautifully designed museum is a joy to visit, whether you are familiar with his work or not. Be sure to take a moment to sit on the outside terrace, accessed from a door off of one of the galleries on the second level. Denver Art Museum plaza – View the striking angular architecture of the Hamilton Building of the Denver Art Museum as well as the sculptures that can be found in the plaza surrounding the museum. Although the museum is pleasant and is a good place for locals to view art, the collection isn’t significant enough that I would recommend visitors on a tight schedule to spend time inside. Perhaps wait until the museum’s 50th Anniversary in 2021, when the expansion and renovations of the Gio Pointi-designed North Building are to be complete. Civic Center Park – Take a quick walk through to get a glimpse of Colorado’s State Capital Building (it’s the one with the golden dome). During the holiday season, there are pretty light displays at night. If you have time to spare, the following spots are worth checking out. Denver Central Library– If you’re in the area and need of a break from the sun/rain/snow, stop into the main branch library of the city. Head to the fifth and seventh floors to check out some artwork (and old maps of Denver) in the free galleries. Pro tip: Architecture buffs will want to stop into the Gates Western History Reading room on the fifth floor. It has a pretty cool design that seems to be inspired by Denver’s mining town history. Brown Palace Hotel – Even if you can’t swing an Afternoon Tea (prices start at $40 and go up from there), Champagne Brunch, or meal at the Palace Arms in the historic hotel, pop inside to view the gorgeous nine-story atrium. View the works of graffiti artists spread all over the walls of RiNo. Over a decade ago, artists and city leaders kicked off an effort to revitalize the RiNo neighborhood into a vibrant creative community. It has now grown into one of the best places in Denver to browse independent shops, see outdoor murals by world-famous artists, and stop in for a meal at some of most buzzed about restaurants in town. Graffiti art has become synonymous with RiNo. Wherever there once was a blank wall you are now likely to find a work of art. Even if you aren’t in Denver in September during the awesome (free!) Crush Walls event, I think the best way to check out the artwork is to plan a stroll based off their event map to take a self-guided RiNo graffiti art tour of the most recent murals (2018: PDF, Google Maps). 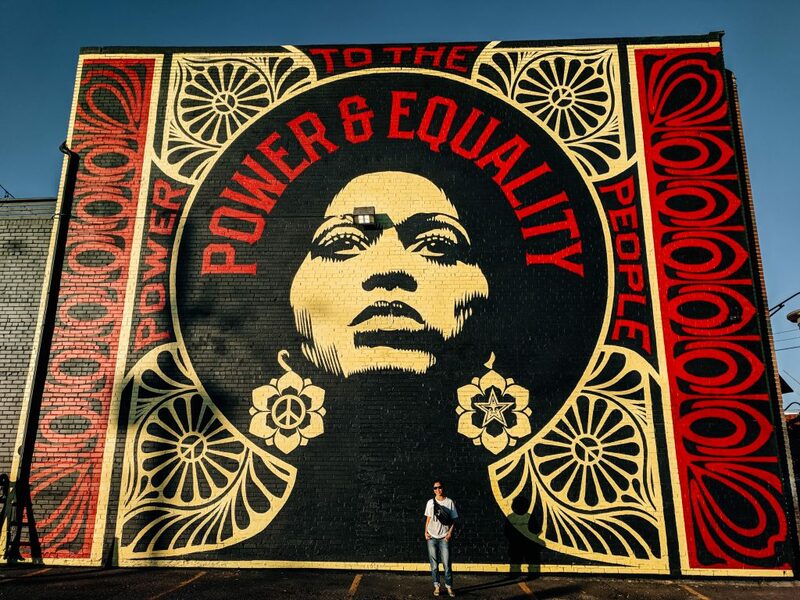 Be sure to stop by the enormous Shepard Fairey mural painted on the side of Denver Central Market. Modern Nomad has an eclectic collection of home goods. While you are checking out the art on the walls, pop into a few local shops to check out their wares and maybe pick up some unique souveniers. Topo Designs – This Colorado company is known for their colorful backpacks and bags. Their logo tees and shirts are the perfect addition to your inevitable Insta shots showing off your (real or staged) super-cool rugged outdoors person achievements in Colorado. SHEA – Hip women’s clothing and accessories store. 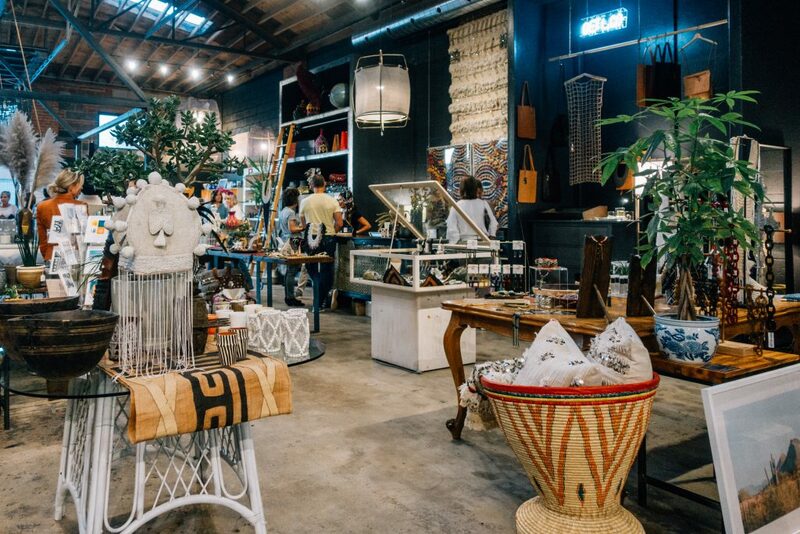 Modern Nomad – Awesome “design collective” space with unique home furnishings, textiles, and gift items, many from Colorado companies. RiNo Made – Great little shop in food hall/retail complex Zeppelin Station that specializes in selling items by local artists. Affordable items like pins, cards, and prints make excellent gifts or mementos. Coperta is one of the top Italian restaurants in town, and a perennial favorite of mine. Coperta – If you follow me on Instagram, you know I wax poetic about Coperta nearly every day of the week. Excellent Roman and Southern Italian food in Uptown neighborhood. Pastas are their strength. The Buccatini with guanchale is always on the menu and a definite crowd pleaser. City O’ City – Lively (and busy) vegetarian/vegan-friendly restaurant with food good enough that even meat-lovers will find something satisfying. Recommended: The Seitan Wings with Buffalo sauce are always a hit. Leven Deli – Good for a casual lunch near the art museums. Family-friendly as well. The patio at Call in RiNo offers a great place to sit and eat on a sunny day. Super Mega Bien – Delicious South American food served in a dim sum format. For two people eating there at dinner, I recommend grabbing three to four small plates off the carts and ordering one item for the table off of the large dish menu if you don’t want to leave with any leftovers. Menu changes seasonally. Death and Co. Bar – I am well aware that Death and Co. is from my hometown of New York City, but they chose to open their second location in Denver in the uber-hip Ramble Hotel and I couldn’t resist putting this on the list. The setting is gorgeous and the cocktails are killer. Denver Central Market – Fantastic food hall with lots of options. Everyone in your party will leave happy. My picks are the pasta at Vero and getting some ice cream at Highpoint Creamery (my favorite ice cream place in Denver). OMF (Our Mutual Friend) – Fun and lively taproom. Call – Scandinavian inspired breakfast and lunch spot serving up deliciously fresh tasting salads, sandwiches, and fresh bread. Named one of Bon Appetite‘s Best New Restaurants in 2018. Beckon – Call’s sister restaurant serving dinner. This 17-seat restaurant requires securing an online reservation (with the meal paid in full) well in advance. Patrons are served an eight-course meal with the option of purchasing a wine pairing. An excellent fine dining experience. Menu changes every month. Infinite Monkey Theorem – Relaxed neighborhood brewery with excellent patio. Dio Mio – Excellent handmade pasta place. Order at the counter, get your number, then find a table. Get your own bottle of water in the fridge. Can get pretty crowded after 7 pm, but unless you are with a large group, seating shouldn’t be an issue. My husband and I always order an appetizer plus our own individual pasta entrees. The Rigatoni with fennel sausage is my hands-down favorite. Hop Alley – Great modern Chinese food in Denver. Come prepared for dishes to be on the spicy side. If you can secure an advanced reservation through their website, do it. Otherwise, it’s walk-in only. I advise getting their five minutes before they open for your best chance of bypassing a long wait to eat at the 57-seat restaurant. Three dishes should be enough for two people for dinner, but I always end up ordering way more (because everything sounds so good) and getting the rest boxed up for leftovers the next day. Don’t miss the Dan Dan Noodles. One of the best things people love about living in Denver is the proximity to the mountains. You’ve probably noticed the Rocky Mountains in the skyline several times during your trip. Today’s the day to get a better look. 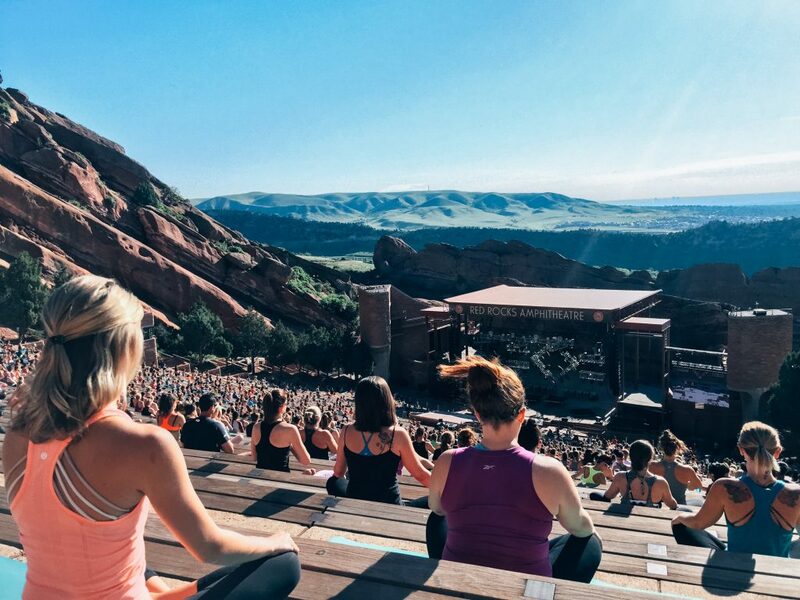 Many people come to Red Rocks to enjoy the view while exercising, including for special events like Yoga on the Rocks. Get up early (like 5 am – 6 am early, depending on the time of the year) to make the 20-30 minute drive to the iconic Red Rocks Amphitheater in Morrison, CO so you can watch the sunrise over Denver. If the weather is nice you’ll probably see people running up and down the steps of the amphitheater to get in their cardio, or doing various forms of exercise on the wide rows. Be sure to take advantage of taking a scenic walk or hike along one of the trails that extend from the park. The Trading Post Trail is a good option if you’re short on time and you don’t really want to break a sweat – it’s only 1.4m and mainly flat terrain. Be sure to check out the Red Rocks event calendar to make sure your visit does not coincide with an event (where access to the amphitheater would be restricted). However, if you are visiting in June – Aug, I highly recommend snagging a ticket to Yoga on the Rocks to do morning sunrise yoga! Pro Red Rocks transportation tips: If you have a current, non-temporary driver’s license and only want to rent a car for the day or a few hours, I recommend using the popular car-sharing service Car2Go (Note: you must be a member to use this service. Sign up at least 3 business days before you plan on using). If you do not want to drive, another option would be to hail a Lyft or Uber to drive you there and hail one (may take 10-15 minutes for the nearest driver to reach you) when you’re ready to head back. 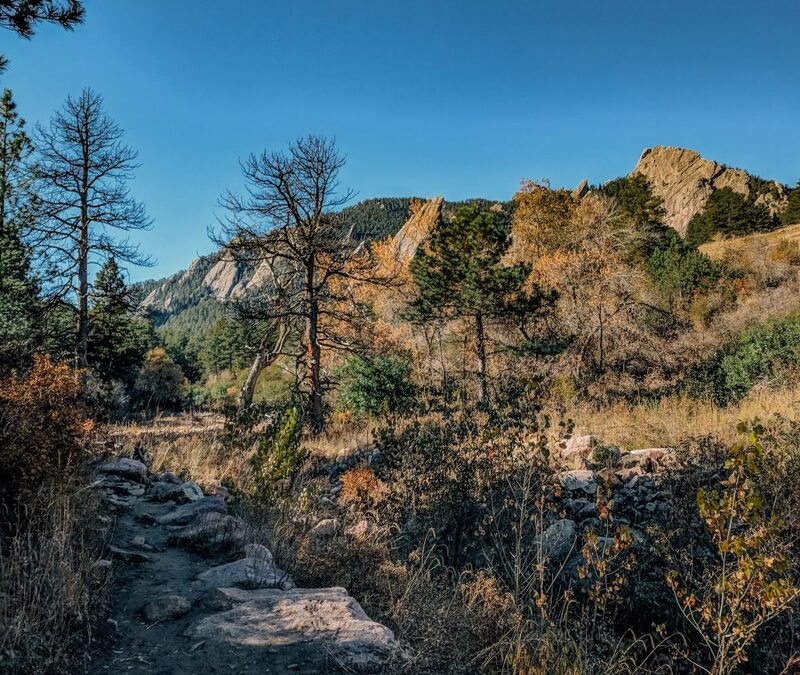 The McClintock Trail offers views of the Flatirons. An alternate area with great mountain views you can get to through public transport is to Chautauqua Park in Boulder, CO. This park offers a wide array of hikes, from leisurely strolls to more demanding treks. Take the FF1 or FF2 bus from Union Station to Broadway & Euclid Ave. Either make the 30-minute, 1.2 mile walk through a residential neighborhood to the park or hail an Uber/Lyft to make the 8-minute drive (Google Maps directions). Stop by the Ranger Cottage to get recommendations about trails. Alternatively, you can check out the online trail map for trail closures ahead of your trip. Popular trails include the Chautauqa Trail and the McClintock and Mesa Trail. A nice add-on to this hike would be a stop in Downtown Boulder. Walk along the charming Pearl Street Mall and stop for a meal or snack. If you don’t want to leave the city but still want a little outdoor action, head to City Park for one of the most iconic views of Denver’s skyline. The best spot to stand is at the back of the Denver Museum of Nature and Science. PhotographyLife.com has the exact details on the best vantage point to get a view of the skyline with the Rocky Mountains in the background. A stop at the Denver Botanic Gardens (where they frequently have special exhibits) is a nice add-on while you’re in the area. Avanti F&B has great food and drinks and a fantastic view of Downtown Denver. While this residential neighborhood doesn’t have much in the way of points of interest or shopping, what it does have are some of the city’s best restaurants. I recommend closing out your final day in Denver with a meal with a view of the city. 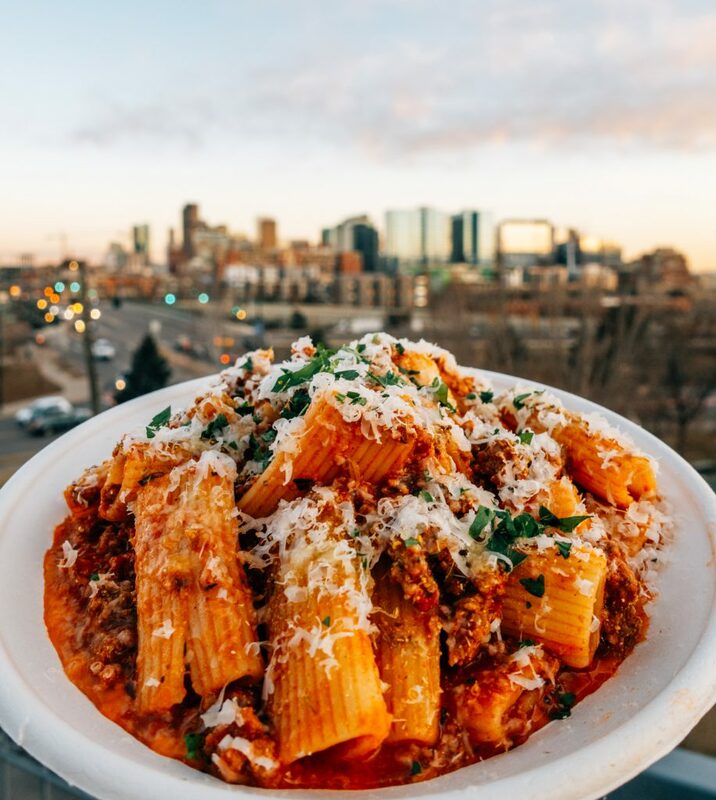 Those looking for something casual will love Avanti F&B, a food hall with a great rooftop bar and great views of Downtown Denver. If you’d like something a bit fancier, Linger‘s rooftop bar has some great views. Food options are very limited, with the Ship Rock Grille as your only option for a place to eat within the park. If you plan on hiking in the area, pack some snacks/lunch, or just wait until you get back to Denver to eat. 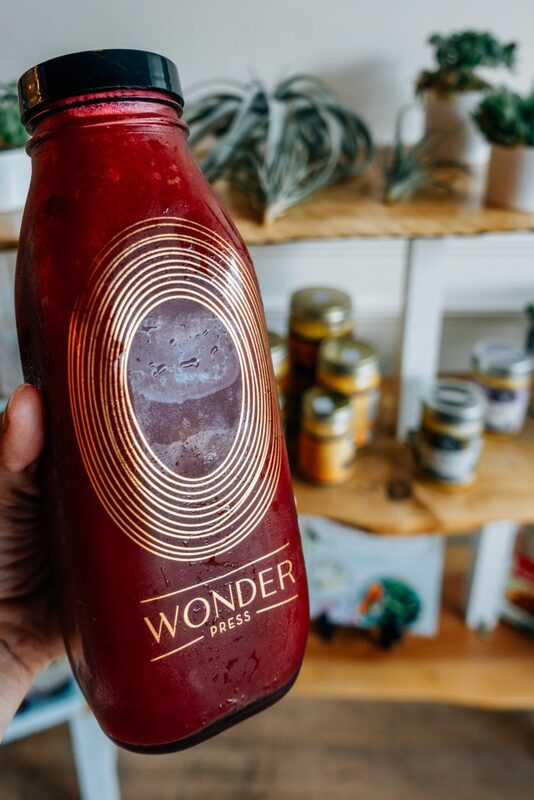 You can find pretty glass bottle of pressed juice at Wonder Press in Boulder. Chimera – Creative Chinese food, including a good specialty ramen. Via Perla – Tasty Italian food. Portions for lunch can be on the smaller side, so be sure to order enough for the table. Leaf – Excellent vegetarian cuisine, just a block off from the Pearl Street Mall. Wonder Press – For all your pricey pressed juice needs. If you can stomach the cost of the juices (around $7-11) it’s a great place to grab a (liquid) snack during the day. The bottles are beautiful, as is the light and airy dining space, often filled with freelancers tapping away on their laptops. Fior Gelato – Stylish, cute shop with creamy gelato. Le Pops – Fun ice and cream pops to grab on a hot day. Frasca Food and Wine – If you happen to be in Boulder during dinner time, Frasca is my number one pick. Diners must choose from one of the available tasting menus (no a la carte dining) and reservations (which you can make via their website) are very strongly recommended. El Five – Another Edible Beats restaurant with spectacular views and a tapas style format. Reservations strongly recommended. Bar Dough – Fans of Top Chef: Colorado will be chuffed to visit the home of Chef Carrie Baird, where she is Executive Chef and Partner. Strong on their pasta game, and of course, fancy toast. The Bindery – New American food with an emphasis on high-quality ingredients. Sleek modern interior and smartly composed dishes. Old Major – Meat lovers will respect the care and creativity that this Denver neighborhood favorite pays to its animal products. They even have their own in-house curing room. Mizu Izakaya – Sushi here is fine, but their ramen is the standout. My favorite tonkotsu ramen in Denver. 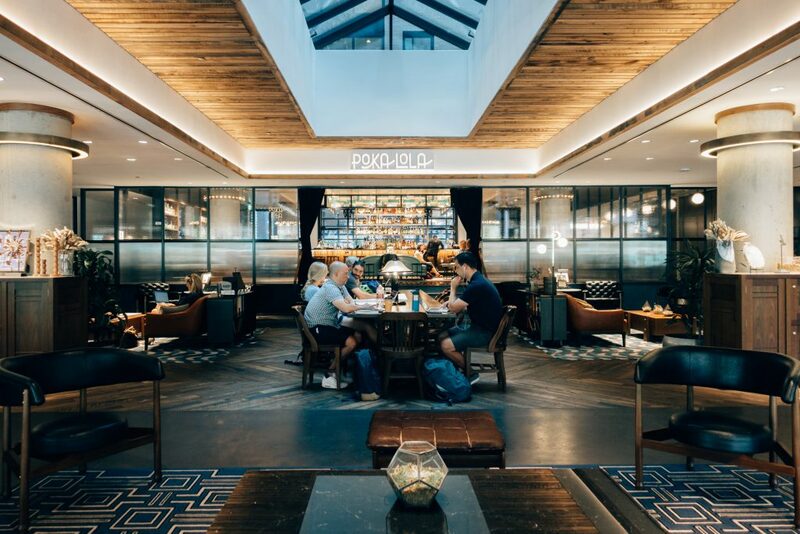 The lobby at the Maven Hotel offers an inviting, communal space to work and relax. For those who are visting Denver for the first time, I recommend staying in the LoDo (lower Downtown) area near Union Station. The location makes many activities on this itinerary within walking distance and due to its central location public transportation and ride sharing options will be plentiful. *Please note: I may receive a commission for hotel bookings made through links to Booking.com in this post — at no additional cost to you. Thank you for supporting this blog! The well-appointed bedroom of the Maker’s Suite at the Maven Hotel also features city views. 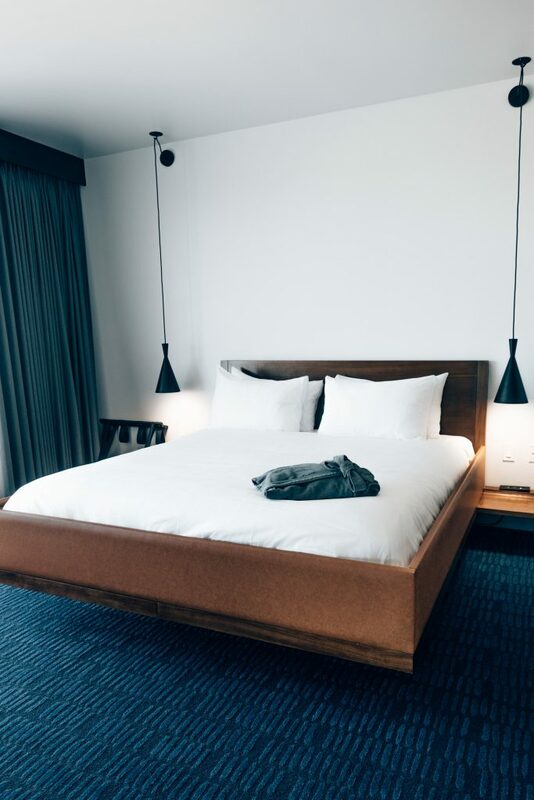 The Maven Hotel – From the city’s glamorous 100-year-old landmark Union Station, it’s an easy 5-minute walk to drop your bags off at the Maven Hotel, a slick new accommodation that opened in March 2017. The location is killer, and it’s situated within the larger Dairy Block shopping and dining development. Another bonus of staying at the Maven is their complimentary car service which will do drop offs/pickups within a 2-mile radius of the hotel based on availability. If you’re searching for even more ideas on where to eat in Denver, be sure to follow me @newdenizen on Instagram. I’m constantly updating my account with my latest food adventures in Denver (and beyond). Also, please let me know what you thought of this guide (and if there’s anything else you think I should add information about) by leaving a comment below. Thanks so much, Julia! Welcome to Denver!